Second last episode before the hiatus, eep! “Mattress” might have started off a bit slow, but by the halfway point it was all action, all drama, and some fantastic scenes courtesy of Matthew Morrison. So let’s get down to gleecapping, “from the top,” as Mr. Schue himself would say! Go ahead and JUMP! : The gleeks perform Van Halen's "Jump" for a mattress commercial. Rachel and Finn cozy up together during their rendition of Lily Allen's "Smile." But it’s not all fun and games in Glee-land, folks. Following the fun mattress jumping scene, we switch to Will searching through some drawers looking for a pocket square (how fancy! ), only to discover Terri’s fake pregnancy belly. He confronts her, she breaks down, and the whole charade comes crashing down. Disgusted and heartbroken, Will storms out and heads to the school, where, as luck would have it, a huge stack of mattresses are waiting, sent by the mattress man as a thank you for the gleeks’ performance. Will unwraps one from its plastic and curls up for the night…but oh no, turns out you shouldn’t have done that, Mr. Schue. Apparently, if a glee club accepts compensation (ie. the mattresses) for a professional gig, they become ineligible to compete in an amateur competition (ie. sectionals). Damn that Sue and her freaky knowledge of the glee club rule book! Fortunately, Will’s clever enough to find a slight loophole, and since he was the one who actually opened the mattress, he steps down from New Directions, thus allowing them to stay in sectionals, but without their leader. Cue the gleeks singing Charlie Chaplin’s “Smile” over a montage of them prepping for their full-page glee club photo (courtesy of Quinn performing a little blackmail action on Sue regarding all the free swag given to the Cheerios that would likely disqualify them from amateur competitions as well), while Will sweetly yet sadly looks on. Kurt uses some old vandalized photos of glee clubs to teach the gleeks that sometimes a little anonymity can be a good thing. Kurt giving the gleeks a history lesson on past glee club members and how after getting their yearbook photos graffiti-ed, they went on to have nervous breakdowns and become hobos. Scare tactics are effective! Emma: “Ken has a lot of flaws. He has 74 flaws as of yesterday.” Tons of love for Emma for sticking up for herself and her hubby-to-be, and basically telling Will to back the hell off. Rachel trying to convince the other glee club members to be co-captain with her and their hilarious excuses. 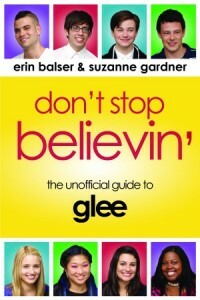 Mercedes blames Kwanzaa, Artie insists that he’s a follower and not a leader, and Brittany assures Rachel that the glee club’s photo will still be defaced because she’ll be the one doing it. Hee! The entire mattress store scene. First off, there’s the hilariously bad commercial acting by the gleeks, and then when Rachel suggests that they “perform” in the ad instead, we get the fantastically fun performance of Van Halen’s “Jump.” Puck and Mike Chang doing awesome flips! Artie sitting in the corner bopping with a sign that says “JUMP!” The girls laying on the bed kicking their feet! Mercedes running between the mattresses and screaming all “chocolate thunder” style! Everyone’s heads popping up from behind the mattresses! Artie being bounced on the bed! All of them just look ridiculously adorable and like they’re having the time of their life, and really, me blabbing on about it has made you want to watch it again, hasn’t it? Seriously, did anyone not love this scene?! The return of Sue’s journal! Also, Quinn’s total kickass-ness. Although she was less of a focus in this episode, her determination to get back on the Cheerios, her blackmailing of Sue, and then her ultimate decision to not re-join the squad after all, ’cause in glee club she feels accepted and wanted? Completely fantastic. Again, I think this week’s episode started off somewhat slow, but oh boy, did it ever pick up! I can’t believe that the gleeks are going to sectionals without Will – they need him! Will made these kids what they are today! I loved seeing the baby drama between him and Terri finally come out though. Does that mean Quinn’s big secret will come out next week? Eep! How excited are you all gleeksters for next week? Can it be Wednesday now?! Next week: Sectionals are finally here! And oh yes, Sue did indeed leak the setlist, ’cause there are other glee clubs doing their numbers! But wait, Emma’s at the competition? Shouldn’t she be at her wedding? What’s going on here?! OH EM GLEE, I CAN’T WAIT FOR NEXT WEEK!